Editor’s note: The following excerpt was taken from FM 21-76: Survival Evasion and Escape, an Army field manual published in 1968. 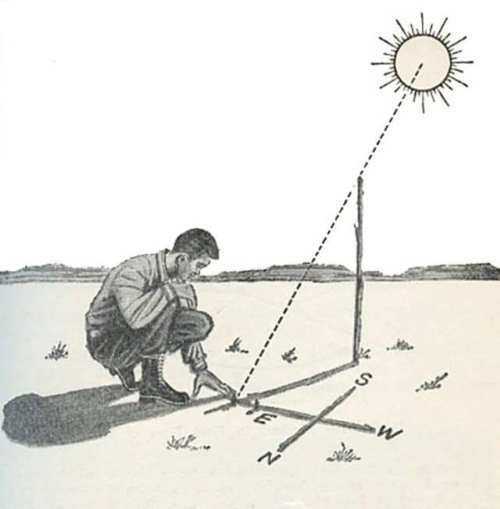 (1) If you do not have a compass, you can use the sun to find approximate true north (and from north, any other direction). 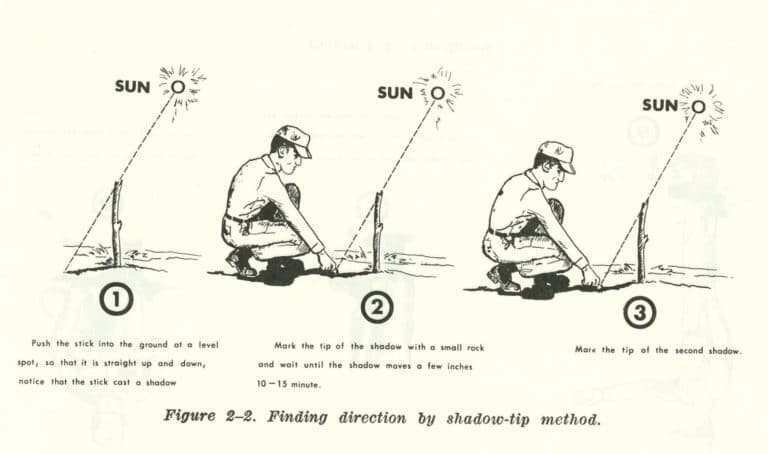 The method explained below can be used any time the sun is bright enough for a stick placed in the ground to cast a shadow (fig. 2-2). Step 1: Push the stick into the ground at a fairly level, brush-free spot where a distinct shadow will be cast. The stick need not be vertical; inclining to obtain a more convenient shadow, in size or direction, does not impair the accuracy of the shadow-tip method. Step 2: Mark the shadow tip with a small peg, stick, stone, twig, your finger, hole in the snow, or other means. Wait until the shadow tip moves a few inches — using a 1 meter stick, 10 to 15 minutes should be sufficient. Step 3: Mark the new position of the shadow tip. Step 4: Draw a straight line from the first rock to the second rock and extend it about a foot past the second rock. 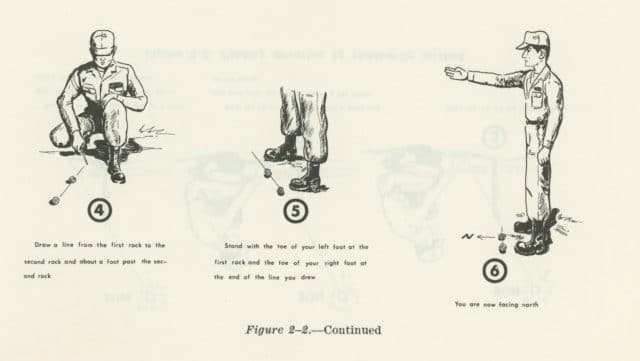 Step 5: Stand with the toe of the left foot at the first rock and the toe of the right at the end of the line you drew. (b) You are now facing north. Find other directions by recalling their relation to north. To mark directions on the ground (as for the purpose of orienting others), draw a line across the first line, forming a cross and mark the directions. The sun rises in the east and sets in the west (but rarely due east and due west). The shadow tip moves just the opposite. Therefore, the first shadow tip mark is always in the west direction and the second mark in the east direction, EVERYWHERE on earth. (2) An ordinary watch can be used to determine the approximate true north (fig. 2-3). In the North Temperate Zone only, the hour hand is pointed toward the sun. A north-south line can be found midway between the hour hand and 12 o’clock. This applies to standard time. For daylight saving time, the north-south line is found midway between the hour hand and 1 o’clock. If there is any doubt as to which end of the line is north, remember that the sun is in the north, remember that the sun is in the eastern part of the sky before noon and in the western part in the afternoon. 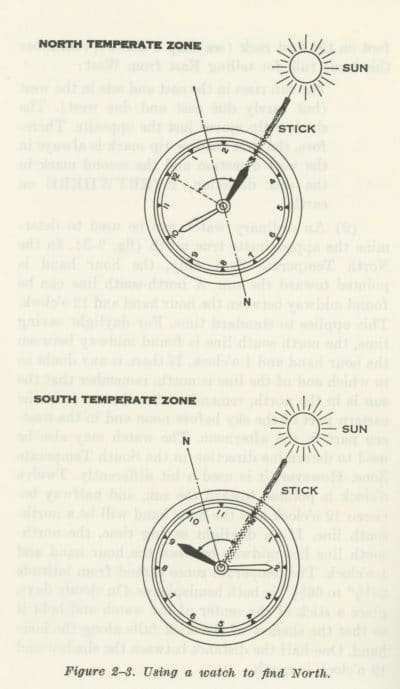 The watch may also be used to determine direction in the South Temperate Zone. However, it is used a bit differently. Twelve o’clock is pointed toward the sun, and halfway between 12 o’clock and the hour hand will be a north-south line. If on daylight saving time, the north-south line lies midway between the hour hand and 1 o’clock. The temperate zones extend from latitude 23 1/2° to 66 1/2° in both hemispheres. On cloudy days, place a stick at the center of the watch and hold it so that the shadow of the stick falls along the hour hand. One-half the distance between the shadow and 12 o’clock is north. (1) To find the North Star, look for the Big Dipper. The two stars at the end of the bowl are called the “pointers.” In a straight line out from the “pointers” is the North Star (at about five times the points). 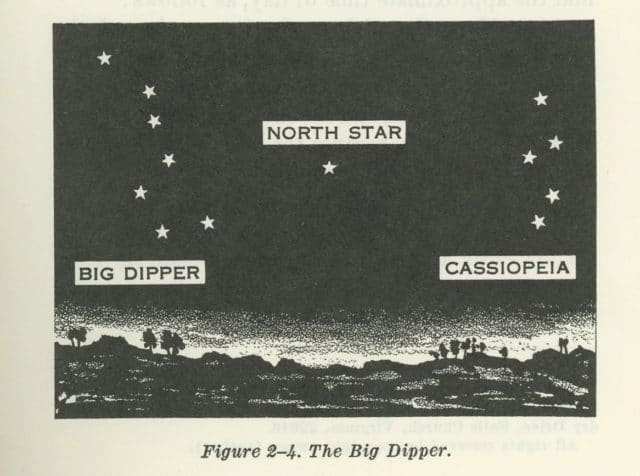 The Big Dipper rotates slowly around the North Star and does not always appear in the same position (fig. 2-4). The constellation Cassiopeia can also be used. This group of five bright stars is shaped like a lopsided M (or W, when it is low in the sky). The North Star is straight out from the Big Dipper. Cassiopeia also rotates slowly around the North Star and is always almost directly opposite the Big Dipper. Its position, opposite the Big Dipper, makes it a valuable aid when the Big Dipper is low in the sky, possibly out of sight because of vegetation or high terrain features. 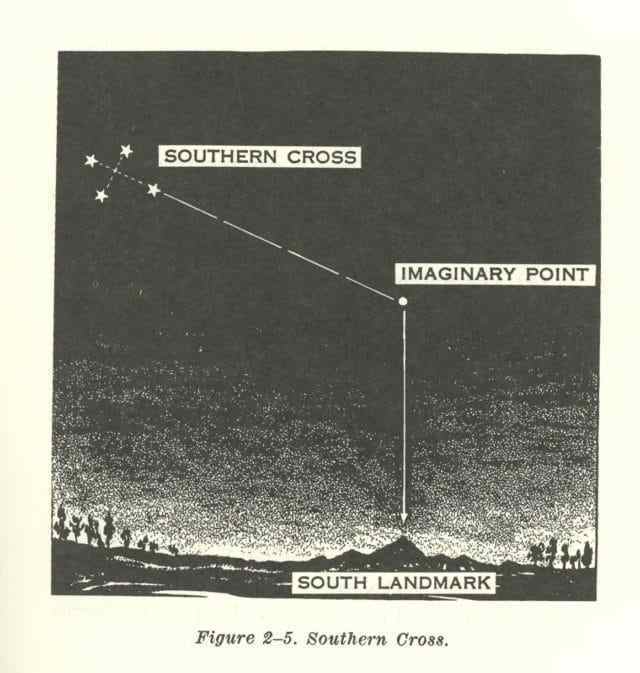 (2) South of the equator, the constellation Southern Cross will help you locate the general direction of south and, from this base, any other direction. This group of four bright stars is shaped like a cross that is tilted to one side. The two stars forming the long axis, or stem, of the cross are called the “pointers.” From the foot of the cross, extend the step five times its length to an imaginary point (fig. 2-5). This point is the general direction of south. From this point, look straight down to the horizon and select a landmark. (1) Move the stick to the intersection of the east-west line and the north-south line, and set it vertically in the ground. The west part of the line indicates 0600 hours, and the east part is 1800, ANYWHERE on earth, because the basic rule, described in 1c in “Finding Direction by Day” above always applies. (2) The north-south line now becomes the noon line. 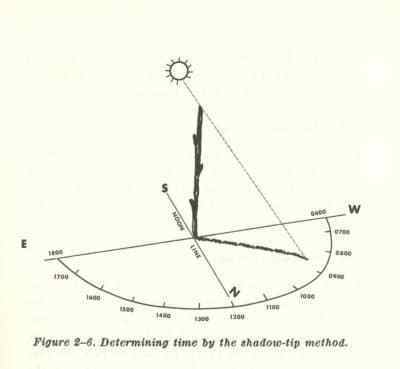 The shadow of the stick is an hour hand in the shadow-clock and with it you can estimate the time using the noon line and the 6 o’clock line as your guides (fig. 2-6). Depending on your location and the season, the shadow may move either clockwise or counterclockwise, but this does not alter your manner of reading the shadow-clock. (3) The shadow-clock is not a timepiece in the ordinary sense. It makes every day 12 unequal “hours” long, and always reads 0600 at sunrise and 1800 at sunset. However, it does provide a satisfactory means of telling time in the absence of watches (which is the usual case with escaped prisoners of war) or properly set watches. Being able to establish time of day is important for such purposes as keeping a rendezvous, pre-arranged concerted action by separated persons or groups, estimating the remaining duration of daylight, and so forth. Twelve o’clock shadow-clock time is always true midday, but the spacing of the other hours, compared to conventional time, varies somewhat with the locality and the date. (4) The watch method (fig. 2-3) very seriously can be in error, especially in the lower latitudes, and may cause “circling.” To avoid this, set your watch to shadow-clock time and then use the watch method. This eliminates the 10-minute wait required to complete a shadow-tip reading for direction and thereby permits you to take as many instantaneous readings as necessary to avoid “circling.” After traveling for an hour or so, take a check shadow-clock reading and reset your watch if necessary. (5) The direction obtained by this modified watch method is the same as that of the regular shadow-tip method using a stick. That is, the degree of accuracy of both methods is identical.